The view from VSS Unity from a height of 51 miles, or 83 kilometers. 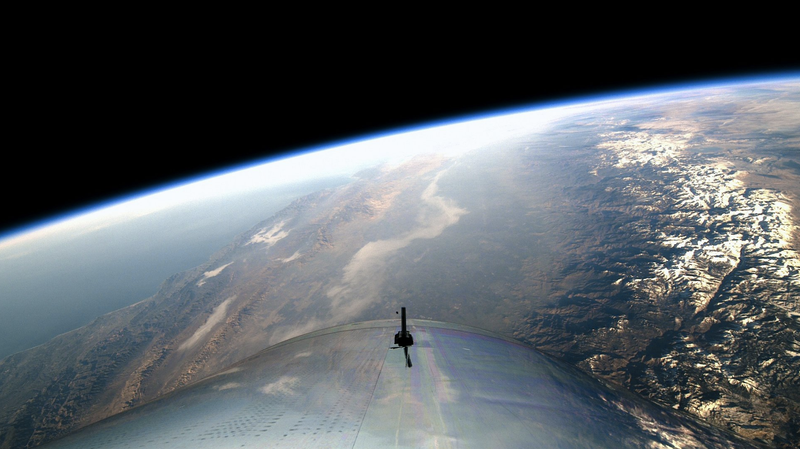 Earlier today, Virgin Galactic sent its SpaceShipTwo commercial aircraft into space, a historic first for the private company. But at a maximum altitude of 51.4 miles (82.68 kilometers), the spaceplane fell 10.6 miles (17.32 kilometers) short of the Karman line—the internationally recognized boundary separating the atmosphere from space. Prompting the inevitable question: What the hell is space, anyway? Before we nitpick Virgin Galactic’s achievement, let’s give credit where it’s due. After 14 years of development and a tragic setback that resulted in the death of a test pilot in 2014, Virgin Galactic has finally reached space, or at least, its preferred definition of space. Earlier today above California’s Mojave desert, Virgin Galactic’s SpaceShipTwo, VSS Unity, reached an apogee of 51.4 miles (82.68 kilometers), according to a Virgin Galactic statement. It was the first space flight for a Virgin Galactic-built vehicle and, somewhat surprisingly, the first human spaceflight launched from U.S. soil since the last Space Shuttle mission in 2011. Also, because NASA’s Flight Opportunities Program was involved (four space science and technology experiments were aboard Unity), it was Virgin Galactic’s first revenue-generating flight. The WhiteKnightTwo aircraft released Unity at an altitude of around 8.1 miles (13.1 kilometers) at around 10:11 a.m. ET. Freed from its mother ship, the suborbital vehicle engaged its rocket engines for a total of 60 seconds, achieving a top speed of Mach 3.9. Mission controllers on Earth congratulated the pilots by saying, “Unity, welcome to space.” Photos taken from Unity show the blackness of space and the distinct curvature of planet Earth. The vehicle reached Mach 2.5 during re-entry into the atmosphere, using its advanced “feathering” configuration, in which its tail wings are angled to to create drag, similar to a badminton shuttlecock. By 11:11 a.m. ET, the mission was over, with the vehicle making a safe runway landing at Virgin Galactic’s Mojave Air and Space Port. As a result of today’s achievement, Unity’s pilots, Mark “Forger” Stucky and Frederick “CJ” Sturckow, are now officially astronauts, based on standards recognized by NASA and the U.S. military. For Virgin Galactic founder Richard Branson, it was a moment he had been waiting for for a long time. But did VSS Unity actually reach space? It depends who you ask. In the United States, the Federal Aviation Administration (FAA) recognizes the boundary at 50 miles (80 kilometers) above the Earth. As noted in today’s Virgin Galactic press release, the FAA will now award pilots Stucky and Sturckow with FAA Commercial Astronaut Wings, which they’ll be presented with at an upcoming ceremony in Washington DC. This 50-mile demarcation line is also recognized by U.S. government agencies, such as NASA and the U.S. military. This boundary is somewhat arbitrary, but it’s located between the mesosphere and the thermosphere—a kind of end-of-the-line for the atmosphere. In Aeronautics, level flying higher and higher meant to deal with less and less dense atmosphere, thus to the need of greater and greater speeds to have the flying machine controllable by aerodynamic forces. A speed so big in fact, that, above a certain altitude, could be close or even bigger than the circular orbital speed at that altitude (i.e. lift was no longer needed, since centrifugal force took over; and consequently aerodynamic flight was meaningless). Conversely, in Astronautics, lower and lower orbital flying led to encounter more and more dense atmosphere, so much that it would be impossible to keep the orbit for a number of turns around Earth without a significant forward thrust (thus making the free fall, or orbiting, concept meaningless). This boundary was calculated to be extremely close to the 100 kilometer mark, so it’s here where the Karman line was set. To complicate matters even further, recent re-calculations made by Jonathan McDowell, an astrophysicist at the Harvard-Smithsonian Center for Astrophysics, suggests the Karman line is actually closer to Earth by around 12 miles (20 kilometers). If McDowell’s calculations are accepted, the boundary would be closer to around 50 miles (80 kilometers), which is satisfyingly close the boundary recognized by the FAA. Regardless, Virgin Galactic is going with the 50-mile boundary. Virgin Galactic hasn’t announced a date for commercial flights of SpaceShipTwo, but today’s launch represents a major step in that direction. To date, more than 600 people have signed up, spending as much as $250,000 for a ticket for a chance to go to space. Or some version of it.